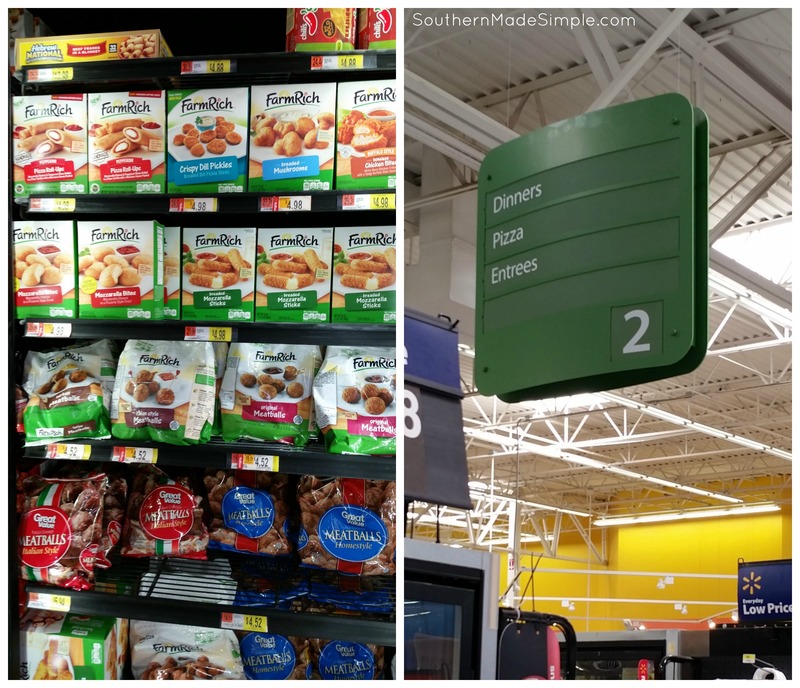 During my last shopping trip at Walmart, I took a stroll down the frozen dinner aisle and passed by the Farm Rich snacks and appetizers. That motion sensor light in the door made it seem like a light was beaming straight down on them from Heaven, y’all! 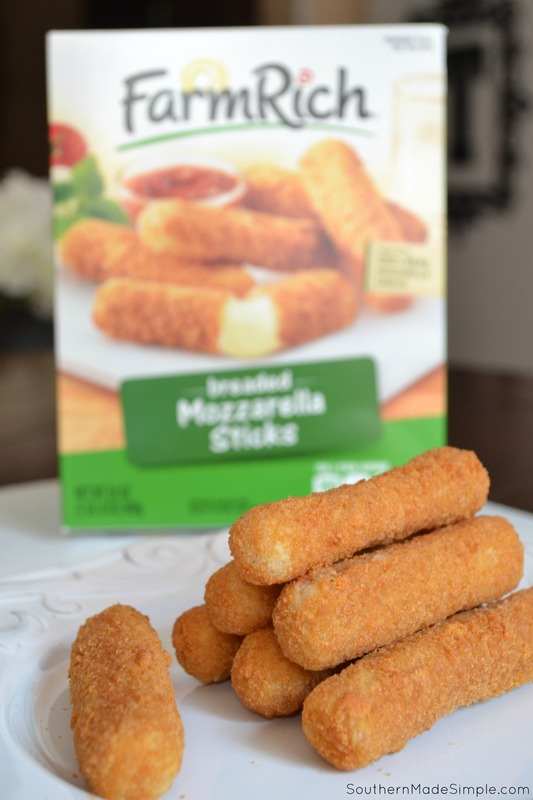 I knew that Farm Rich carried mozzarella sticks, so those were definitely making their way into my shopping cart, but I was really surprised by their selection of other snacks! 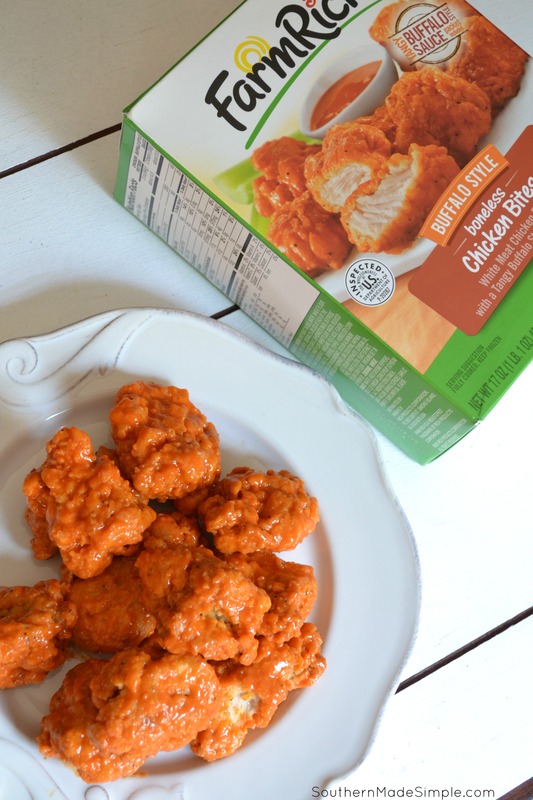 Their Buffalo Chicken Bites were calling my name (my family loves spicy foods,) and I knew that they would be a great solution to creating a more balanced meal for my family during those busy week nights. And then I got to thinking about what I would serve with the Farm Rich appetizers. 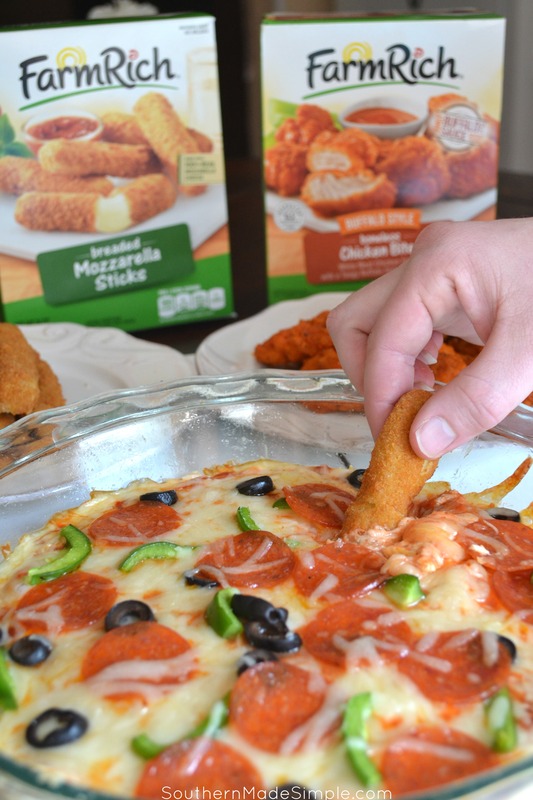 Most people love to dunk their chicken and cheese sticks in a sauce of some sort, but I wanted to really transform these snacks into a perfect pairing for a perfect meal that my family would love. Then it hit me: What if I skip the sauce and go with an amazingly awesome dip?! And what better dip to dunk those delicious appetizers in than that classic cheese dish we’re ALL crazy about? That’s right, y’all. 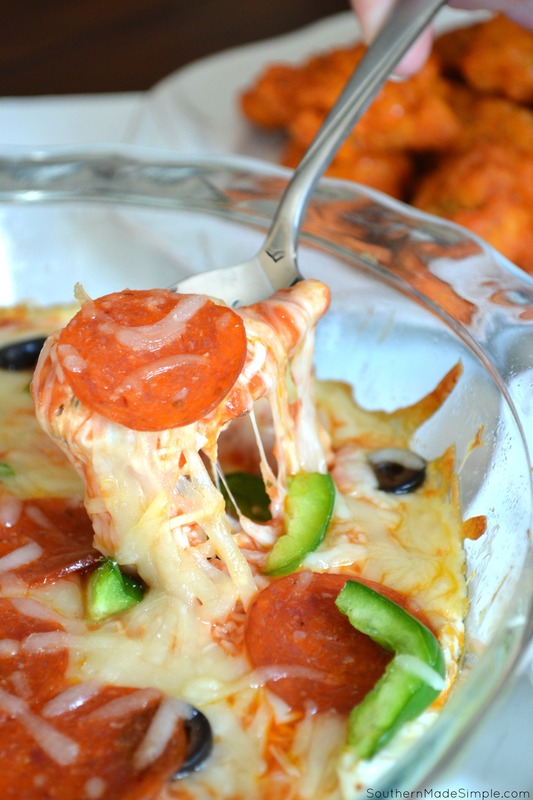 I’m talkin’ about making a super ooey gooey easy peasy cheesy pizza dip, and IT. IS. EPIC! I’m not pulling your leg here, y’all. This is seriously a dip of epic proportions! It tastes just like a real pizza, but no crust required! The fact that this can be done in 20 minutes bumps it right up to the top of my list of favorite dips of all time. It’s a game changer! 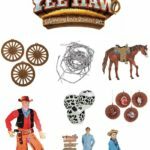 While I was at Walmart, I picked up the remaining ingredients that I needed for the dip. I started out combining a softened brick of cream cheese, a blend of Italian seasonings and a little cheddar and mozzarella cheese in a bowl. I popped the pizza dip into the oven preheated at 350 F and let it cook for 15 minutes, or until the cheese was nice and bubbly. While that was baking away, I broke out the Farm Rich appetizers and got those ready to go. I really believe that Farm Rich had busy parents like me in mind when they created their products. 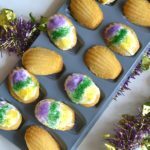 The easiness and convenience of them really make them a freezer staple item for my family! 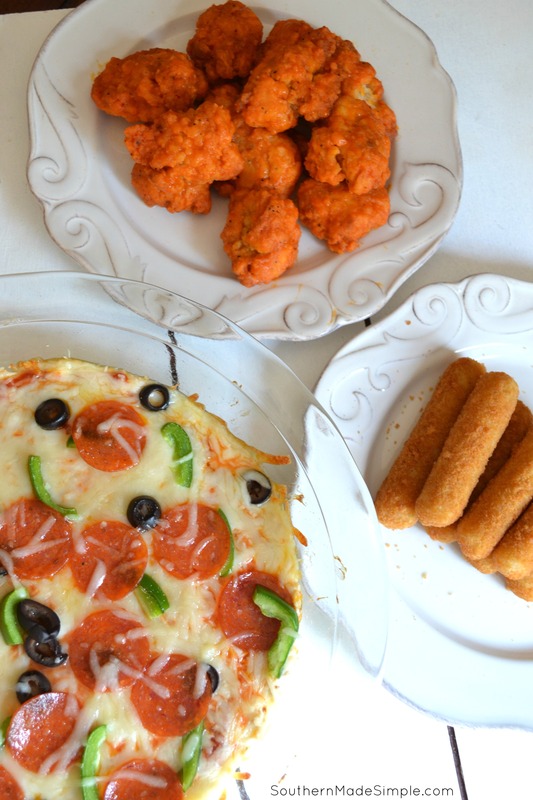 I’ve never had any other frozen snack or appetizer that can even remotely compare to the mozzarella sticks and buffalo chicken bites that I fixed to go with the pizza dip. I’m itching to go back and try all of the other varieties they offer! The instructions on the back of the box were easy to follow, and within just a few minutes both the cheese sticks and chicken bites were ready to devour! The pizza dip came out of the oven and was cooked to perfection. 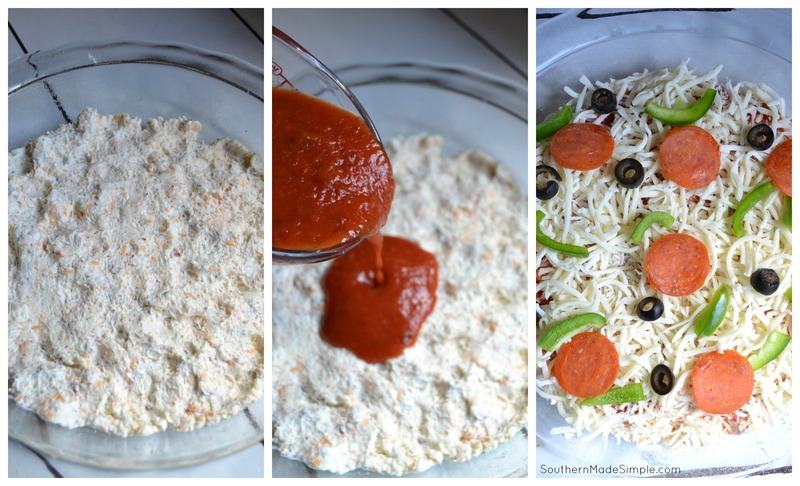 One of my favorite things about this dip is that you can truly customize it just like you would a real pizza. If the kids don’t like veggies but you do, put the veggies on one side! Add some mushrooms, pineapple, jalapenos, or just keep it at cheese and pepperoni only. It’s up to you! 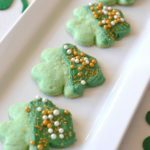 Here’s a free printable version of the recipe if you’d like to give it a try. In addition to dipping mozzarella sticks and buffalo chicken bites in it, you can try it with garlic bread, tortilla chips or your favorite cracker! pepperoni + additional toppings (optional) - I added green bell pepper and black olives to mine! 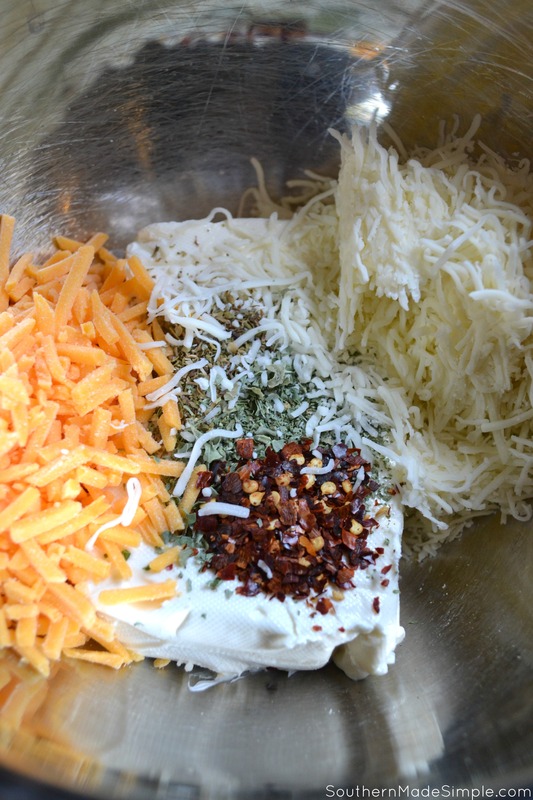 In a large mixing bowl, combine cream cheese, spices, ½ cup mozzarella cheese and cheddar cheese. Not only is this meal perfect for the busy back-to-school season, but it’s also a big winner on game days and at parties! 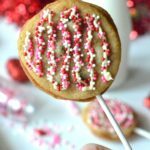 Getting to dunk a delicious buffalo chicken bite or cheesy mozzarella stick into the it is just the icing on the cake! 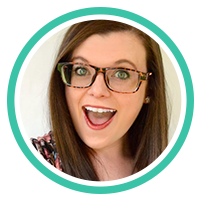 Is back-to-school season super busy for you? 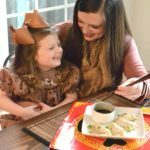 Are you ever left feeling like you don’t have much time to get a meal on the table that your family will love? If so, swing by the frozen food section at Walmart and pick up a few varieties of Farm Rich snacks to keep on hand. 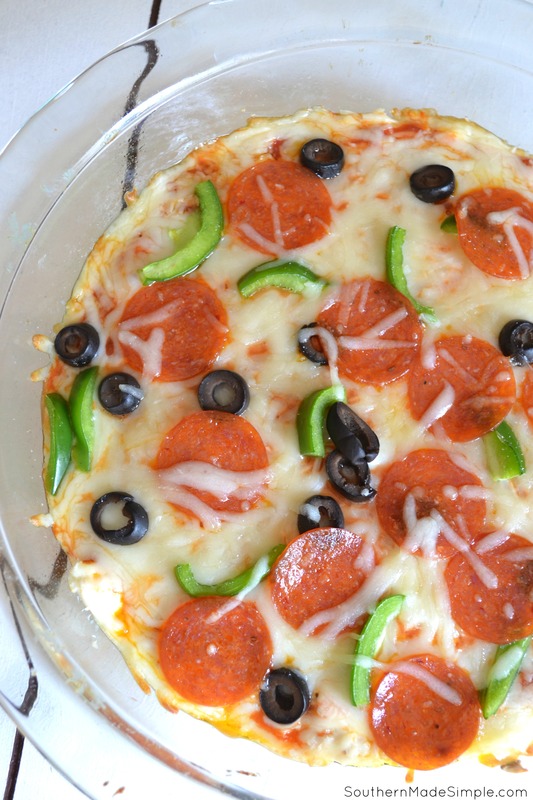 While you’re at it, pick up the ingredients you’ll need to make this crazy easy pizza dip and put a little “yum” into your busy back-to-school routine! If you’re excited to give Farm Rich appetizers a try (of if you already love them like I do,) click here to join the Farm Rich Loyalty Club! You’ll score a sweet money saving coupon and get other deals and promotions all throughout the year! Get Farm Rich Festive this Falliday! 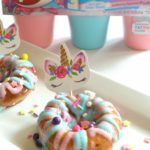 If you’d like to see more creative ideas using Farm Rich snacks and appetizers, head on over here for all sorts of delicious inspiration! There’s all kinds of fun recipe ideas to help turn your busy Fall schedule into something wonderful!